Camping or normal bedroom - follow the links to the left for details. Our finca [farm] is situated alongside the tranquil and beautiful area of the Sierra Tejada National Park. One of the very best things about living or visiting this area is being able to walk or ride in the National Park. 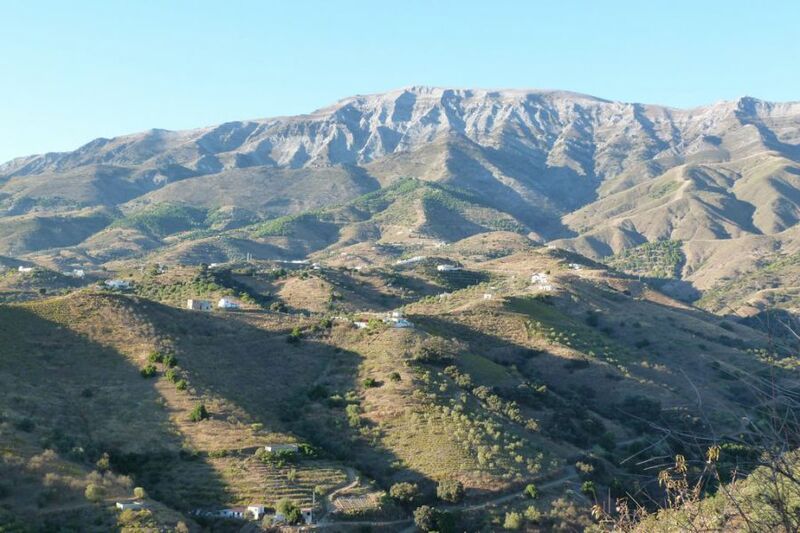 We are situated 600 metres above sea level, and our finca can be found between the two famous Andalucian white villages, Salares and Sedella. Our location is approximately 1 kilometre down a track within the Campo. The finca is in a peaceful setting and surrounded by unspoilt countryside with panoramic views all round. Mount Maroma can be seen to the North with views of the Mediterranean to the south. Maroma is the mountain shown at the top of this page. Summers are hot, spring & autumn are warm, & winters cool. There's more information on the weather page. We average 330 days of sunshine a year. Therefore it is a very healthy and outdoor life that we live here. Since moving to the region in 2007 we have only encountered snow twice. The first time we saw it we wondered what it was!! Even in Winter you hardly ever have to wear a coat. It can get very hot during the Summer months of July and August with temperatures rising towards 40 degrees. Spring and Autumn are the best times to visit with temperatures averaging a cooler and more manageable 28 degrees. Even so, the best times to go out walking, riding or bird watching is early in the morning. I think one of the things that strikes you most when visiting this area is just how quiet and peaceful it is here and you feel at-one with nature. If this is the kind of experience you are looking for then I am sure you will enjoy a visit and experience for yourself this wonderful area and all it has to offer. It is a fantastic area for bird watching and we often see Eagles on the wing, swifts, bee-eaters, & even vultures. So I would say it is a bird lover's paradise.